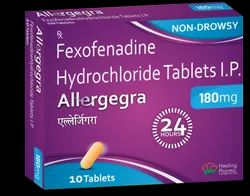 Allergegra 180mg Tablet is a very effective medication to treat allergic symptoms associated with Rhinitis and Utricaria. Allergies such as runny nose, watery eyes, sneezing, skin itching and hives can be effectively treated with this medicine. It is also used to treat seasonal allergies in adults and children. Allergy is a disorder of the immune system often also referred to as atopy. Allergic reactions occur to environmental substances known as allergens; these reactions are acquired, predictable and rapid. Strictly, allergy is osne of four forms of hypersensitivity and is called type I (or immediate) hypersensitivity. How often have you been troubled by bouts of sneezing and an itchy, runny nose that persistently lands up with you precisely on the day of your important presentation If this happens more than once in a while with you, it's about time you sought treatment for your Allergic Rhinitis. People with allergies have extra-sensitive immune systems which react to normally harmless substances. Allergens that sometimes produce this reaction include plant pollen, dust mites, or animal dander; plants such as poison ivy; certain drugs, such as penicillin; and certain foods such as eggs, milk, nuts, or seafood. A substantial number of studies have investigated the prevalence of contact allergy in the general population and in unselected subgroups of the general population.The aim of this review was to determine a median prevalence and summarize the main findings from studies on contact allergy in the general population. Published research mainly originates from North America and Western Europe. Vaishnavi Life Sciences Pvt. Ltd. Diagnosis to reveil 313 types of allergies & help to clear the same. we specialize in diagnosis and therapy for allergies - fully computerised. Skin blackening is due to the increased production of the pigment known as melanin. Our oral medications help in controlling this excess production of melanin and thus bringing back the original complexion of the skin without any side effects. Patient was having acute itching on both legs and arms and belly for last 1- 1/2 yrs. She was under allopathic treatment . Itching was so severe that resulted in bleeding from infected regions. Skin was scaly, dry and was discoloured.Mentally patient was loose tempered and very irritable, Blood pressure was also on the higher side. Allergy is generalized terminology. It is hypersensitive reaction of immune system to various things. People who have allergies are often more sensitive to more than one stimuli. Allergy can vary from minor to severe grade. 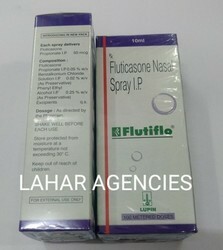 Sinusitis, allergic rhinitis etc are taken care of by sinus therapy- eliminating sinus pain and usage of herbal nose drops. Allergic people's bodies recognize the foreign substance and one part of the immune system is turned on. Allergy-producing substances are called "allergens."